I had wheedled my way out of a group dinner for my friend’s birthday, and offered to take her out solo instead. My objective was a price range that belied quality of cuisine, and close proximity to my physical therapist so I could hobble there after my appointment. 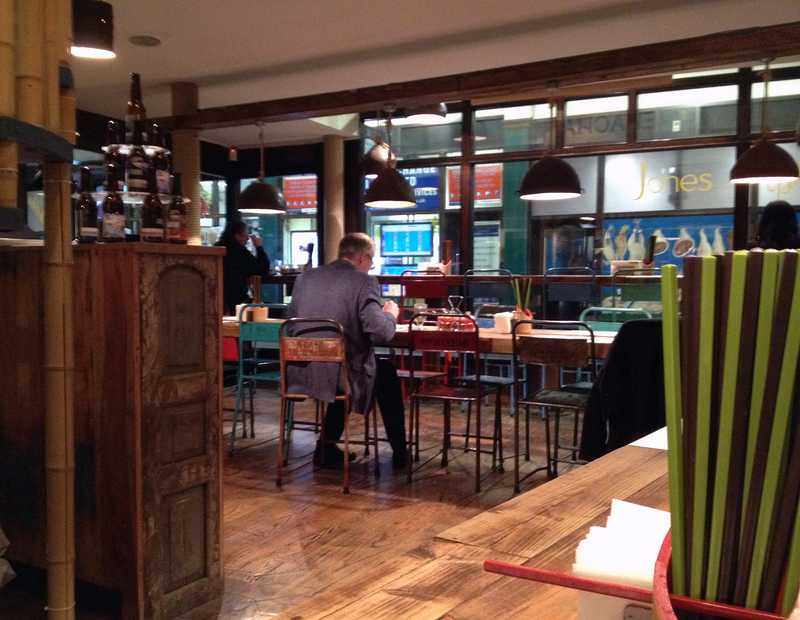 Out of four options I presented to my friend, she picked Ekachai, the Liverpool Street location of this small chain. London’s City financial district has a cornucopia of banker’s budget restaurants, fast-lunch options, and Ekachai, nestled in an unglamorous arcade by Liverpool Street underground. The menu claims to offer Southeast Asian street-style food, but I’d have to be a much more graceful eater to consume a hefty bowl of curry on a sidewalk. A Monday night visit required no reservation. The restaurant has two floors of seating but that evening only saw about 15 customers at any given time, which meant the wait staff was attentive and forgiving. Bare wood tables and metal chairs don’t scream relaxation, but this space had feng shui in spades; I felt at peace in the roomy downstairs dining room. We ordered a bottle of Sauvignon Blanc and took our time ordering food, drawing out the process after choosing “soft shelled” crab to start. (The soft shell was intact, so I’m chalking this up to a grammatical mishap on the menu.) Our waitress came back again and again with the same patient smile, until we decided on our main courses. The crab starter was diminutive but divine. 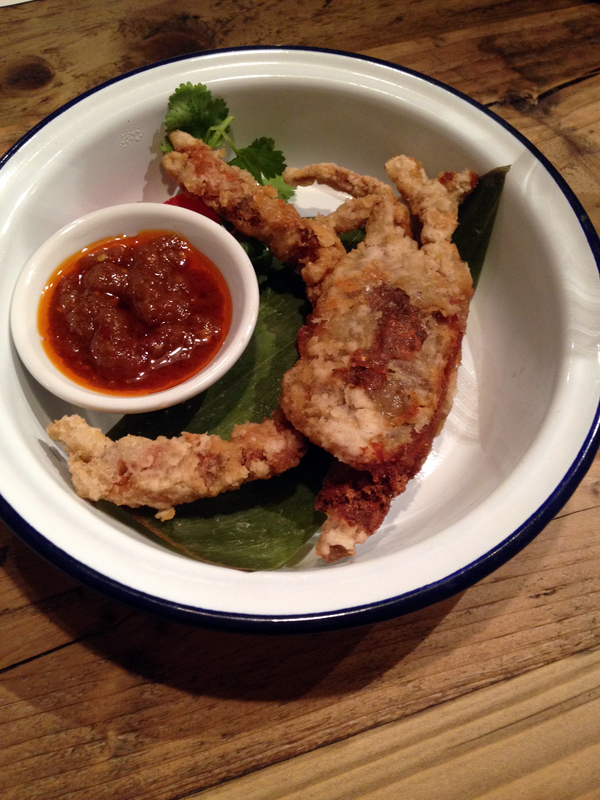 A whole soft-shell crab was lightly breaded and deep fried, then laid on a leaf beside a pot of sambal chili sauce. Apprehension about how to approach sharing gave way to raw desire. We tore the little guy in half and spent the next 90 seconds crunching happily. The chili sauce was potent and I went easy on dipping, leaving my palate open for the sublime subtlety of fresh crab meat. Once agreed upon, the main dishes took less than 10 minutes to reach our table. Mine was a steaming, golden bowl of Malaysian Kapitan Chicken curry. I chose egg-fried rice to accompany it and surprised myself by stopping just short of wolfing it all down. A good curry often goes down faster than my stomach can protest, but this was quite a generous portion. The light curry broth boasted great depth of flavor through roasted coconut and lemongrass. My friend had an equally gratifying—if stodgier— main: the Char Kway Teow. She opted for prawns over tofu, which came tangled on a smoky brown bed of flat rice noodles. Like the ubiquitous Pad Thai loved by Westerners worldwide, this dish merged a rich sauce with satisfying bite. Egg and bean sprouts sang back-up for this crowd-pleaser. We scraped back our chairs and sipped our wine, letting the enzymes do their thing. 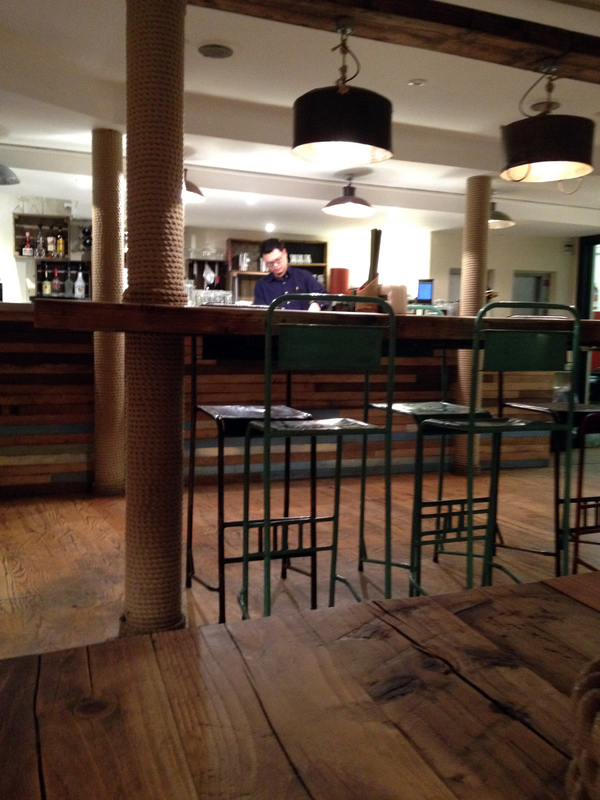 Our waitress gave us time and space to linger. We took a quick trip upstairs and discovered a bathroom so comically small we had to take turns closing our cubicle doors. Disappearing out the door, I was struck again by the drab interior of the arcade and how this bright spot had brightened my evening. Here is a little capsule of a Southeast Asian canteen in the heart of London, and for those missing Thailand on dark days, it’s a happy escape. This entry was posted in Restaurants, Travel and tagged Asian food in London, Char Kway Teow in London, Ekachai, Kapitan chicken, Liverpool Street restaurants, London City inexpensive restaurants, Malaysian food in London, soft-shell crab, Thai food in London by aquixie. Bookmark the permalink.